Staffers of the Maharashtra State Road Transport Corporation (MSRTC) called off their strike on Saturday, after their union representatives held a meeting with State Transport Minister Diwakar Raote. Leaders of workers’ unions said they had decided to withdraw the strike after a “positive round of discussion” with the minister. Earlier in the day, leaders of various workers’ unions of the MSRTC had held a meeting with Ranjit Singh Deol, the managing director of the transport body. When they failed to resolve the issue, Raote invited the representatives for a second meeting on Saturday afternoon. Sandip Shinde, a union leader, said the strike had been called by workers over the lack of “clarity and transparency” on the way the salary hike was implemented by MSRTC from June 1. Raote has promised to resolve the concerns about the formula adopted for salary hike, he said. “The strike was an impromptu protest by workers, who were unhappy about the insufficient salary hike and the non-transparent way in which it was implemented. We brought all the issues… in the wage revision… to the minister’s notice. The meeting lasted for two-and-a-half hours and the minister assured us about the steps that will be taken to resolve the issues. That’s why a decision to withdraw the strike was taken,” said Shinde. On Saturday, the second day of the strike, 80 per cent state transport buses had stayed off the roads in Pune. The strike had hit the travel plans of thousands of commuters across the state. Private bus operators had to accommodate the increasing number of passengers. On Friday, the state Transport Department had issued a notification, urging private operators, owners of school buses and goods transport vehicles to step in to help the stranded passengers. As a recent directive by the state government prevents private bus operators from charging any fare above 50 per cent than that of public buses, the operators sold the seats at relatively affordable prices. Santosh Umap, who wanted to visit Nashik for a family function, said he waited for an entire day, hoping that the strike will come to an end. On Saturday, he finally decided to travel in a private bus. “I was apprehensive as private operators often charge exorbitant fares during such periods. However, this time, the fare was only slightly higher than what I would have paid for a journey on an MSRTC bus,” he said. Long queues of passengers were seen at MSRTC stations in Shivajinagar and Swargate, as they waited to receive a refund for reservations on state transport buses that did not ply due to the strike. Usually, on weekends, about 60,000 passengers travel from various MSRTC stations in Pune division, said officials of the state transport body. “Despite the strike, about 20 per cent buses are plying, thanks to buses hired from private firms like Shiv Shahi and Shivneri. Also, some unions have not participated in the strike and their members are reporting to work. 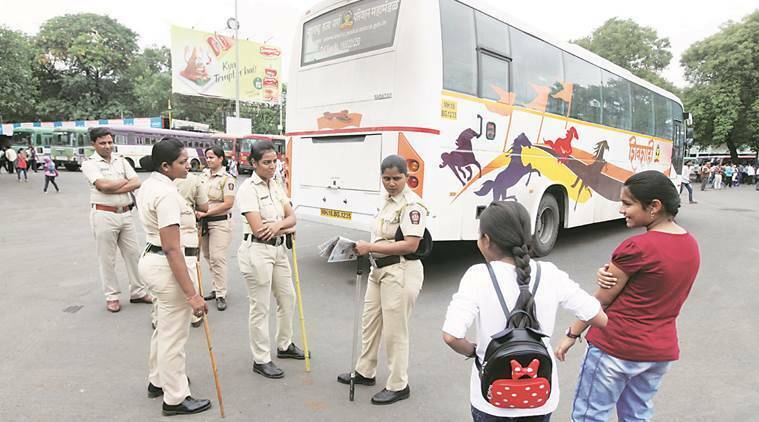 Outstation buses, which were stationed in Pune on Friday, have been sent back to their home depots, with the passengers,” said Dnyaneshwar Ranaware, depot manager, Shivajinagar MSRTC depot. The transport body has already incurred a heavy loss of Rs 32 crore in the last two days, due to buses remaining off the roads and bookings being cancelled.